Maggie's Big Home: Dramatic Play: The Life of a Fish! It is important for children to develop respect for people, animals, and our environment. One of the ways to do this is to have children imagine the life of an animal. And what better way to do this than through dramatic play? Celebrate the life of Women in Science by appreciating famous oceanographer, Sylvia Earle. Learn more about her by signing up for our free weekly activities! You live in a sparking blue world. That’s because you are a fish. Everyone put a bubble in their mouth and flap your elbows in and out to swim like a fish. Fish keep their eyes open underwater. So look around. Remember, fish are quiet. As you look around, think about what a fish sees. Does your fish see another fish? Does your fish see lots of underwater plants? Does your fish see the bottom of a boat above? The follow-up to a dramatic experience can help children understand more about the topic. You can ask what new words they learned. Some may say nibble or glide. This increases vocabulary. Ask what they learned about fish habits. They may talk about swimming in schools or hiding in plants. This helps them learn more about science. Then show children a plastic grocery bag. Ask them how a fish might feel if this is in the water. Use this chance to talk about the dangers of pollution. Dramatic experiences like this help children learn important content-related lessons – not to mention, they give preschoolers practice in listening and following directions! You can print the fish below. 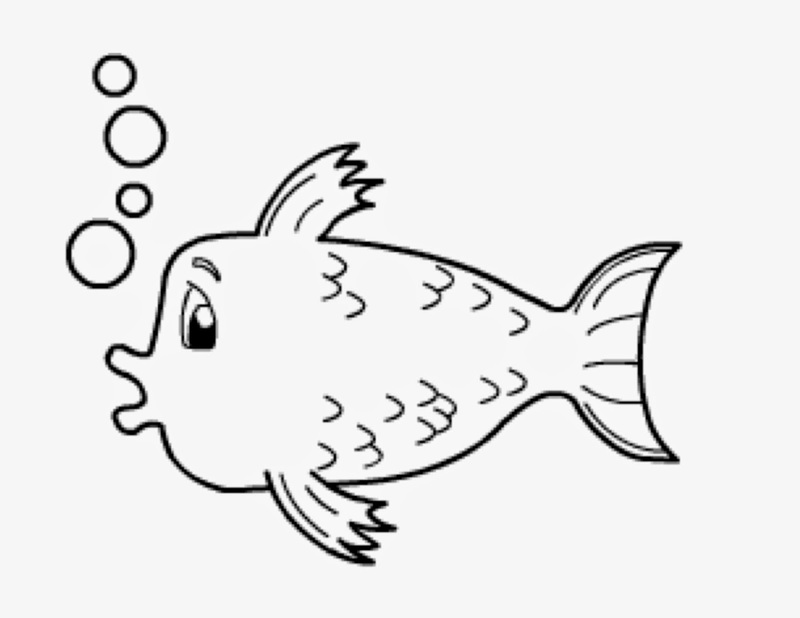 Children can color it, cut it out, and use it to tell a story about life as a fish. Head Start – I.C., III.B., III.D., IV.C., V.B., VIII.A., XI.B.